In order to say "thank you" to the UAE labour force and to remind the people of the UAE about these workers, two expats have sacrificed their comfort and are now fighting rough weather conditions while on their way to summit, the highest peak of Europe - Mt Elbrus. Russian expat Olga Zolotova, 26, and her hiking friend Mohamad Khalaf, began their climb to summit the highest peak of Europe at 5,600 metres. 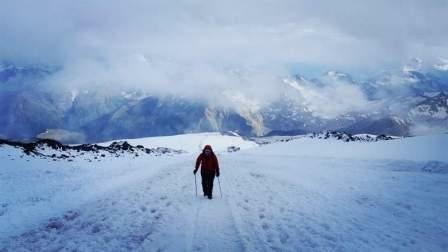 It is an 8-10 days' climb; a tough and risky journey, mainly due to severe weather conditions and climate of Elbrus, but the main challenge is altitude. On returning successfully, the duo, in cooperation with Emirates Red Crescent and Times Square Centre, will run a charity campaign to collect hygiene and personal care items (shampoos, soaps, towels etc.) for labourers. "We invite all citizens and residents of the UAE to participate in our initiative and to say one big "thank you". Between September 3 and September 20, you can drop your contributions in the boxes kept at the Times Square Centre. We do not ask for much - a soap or shampoo for Dh5-10 is more than enough! For many of us, this cost is nothing but for those workers it might be a lot." Speaking about the idea behind the charity, Olga told Khaleej Times: "I am sure we all are aware of those people - the workers in Dubai - who maintain our daily convenience and comforts. These are the people, who leave their families back and come here to ensure their loved ones will also have comfortable life back in their country. Though I am aware the labourers are being taken care of by our government, every time I see them working on the streets, I always wanted to say a personal 'thank you' for doing all this to make this city and my life safe and clean." Since Olga and Mohamad love sports and believe in giving back to society, they used sports challenges to raise awareness about social causes. The duo have done a number of charity challenges such as cycling in the desert, running marathons and even took up a seven-day tough climb to Mt Kilimanjaro to hoist the flag for tolerance in the UAE. About their training for the climb, Olga said: "For the last couple of months, we have been training twice a day. We wake up every morning at 5am and do cardio training and gym; then we go to office and in the evening from 7-9pm we train again. There is nothing that can really prepare you for the altitude, but by doing lots of running, swimming and stairs run you can help your body to get used to cardio activities and by training in the gym you can ensure you will be able to carry your 20kg bag all the way up. According to Rebecca, the general manager of Times Square, that will be helping Olga and Mohamad in collecting the items by placing the donation boxes around the mall, the initiative will serve as a CSR for their organisation. Giving out a message, Olga said: "Mohamad and I are just normal UAE residents, we have our regular office jobs and we do not make funds on our charities. On the contrary we always try to contribute and to involve community to take part in our CSR campaigns. Two of us cannot help many people but with support of other people we can do something much bigger! We invite people again to take part in our initiative and to support UAE labourers. After September 20 we - along with Red Crescent and Times Square management - will be visiting labour accommodations and distributing donations. We welcome everyone to join us at any stage of our charity challenge. Please help us to thank our labourers."